Newshosting Review - $9.99 Discount - A Good Service? 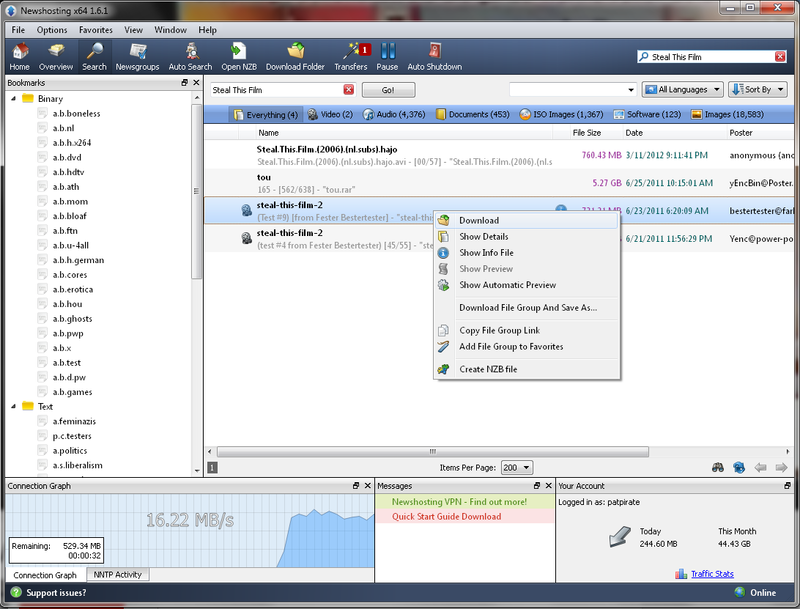 Newshosting offers a high file retention and is able to max out even very fast Internet connections. 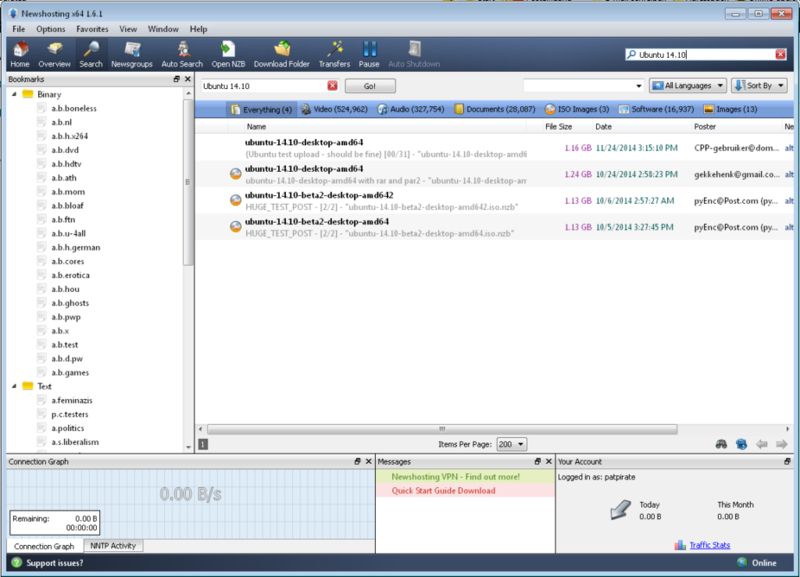 Also included is a Usenet client that is easy to understand and use even for total beginners, so this service is particularly suited for you if you’re just getting your feet wet. The build-in search engine is as-good-as or even better than many web based indexers, although we would have liked some more features to filter out fakes. With unlimited plans starting at just over $8 per month, it is also one of the cheapest around. This provider is currently one of our favorites, and can be safely recommended for almost anybody. Newshosting can be considered a “senior” provider; they have been around for over a decade. The Usenet access they offered was always good, but so where the prices – Nice but somewhat standard. Over the years however they drastically upgraded their server farms to keep up with the emerging high-speed Internet connections, and kept up with the latest developments in the market. In 2012, they announced their own newsreader, boldly named “Newshosting Newsreader” (available free of charge for members) which performed very well in our tests. Especially the search feature impressed us as it very much resembles the ones from big commercial providers such as UseNeXt and Firstload which cost considerably more. Fast forward to 2015, and the picture has changed once again. 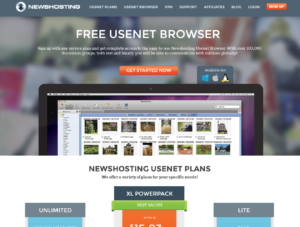 With pricing even under the very moderate industry standards, very high downloading speeds and a considerably updated newsreader, they have become our favorite, allround Usenet service, with only little issues spoiling the picture a bit. Nothing much to say about the website: It is easy to navigate and provides you with all important features and technical details about their service you need, such as technical details, additional options such as their VPN service, and how to reach their support: Overall we like the layout. However, there is a catch: The pricing is a bit higher on the front page than it needs to be, as we’ll discuss in the next section of this review, and one or two extra services you might not really need are offered. You can save a few bucks by ditching these if you decide against them. The signing up process is pretty straightforward: Credit card and Paypal are offered, although it is encouraged to choose Paypal. Upon choosing the plan of your choice (more information on these below), you enter your desired username and password, along with your email, and hit continue. After that, you select the payment method and off you go: It just takes a few seconds before you can access the members area and either download the Newshosting client or get access to the server info to enter into a third-party program such as SabNZBD+ or Alt.Binz. Going the nowadays very popular way of offering only unlimited plans, Newshosting essentially gives you two options, an exception being the 50 GB volume restricted plan for $10.00 with rollover, which means unused volume gets passed over to the next month. While this is still much cheaper than some other “premium” services, we can’t recommend this option… you’ll see why in a moment. 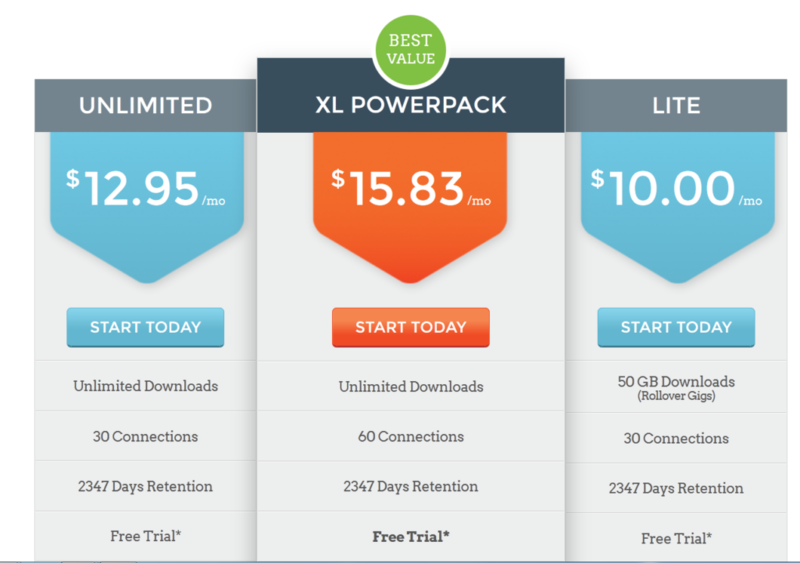 The main options are the “Unlimited” and “XL Powerpack”, starting at $12.95 and $15.83 per month respectively. The key difference between both plans is the bundling of extra services that come with the “Powerpack”, and it is up to you to decide whether you need them or not. First of all, both plans give you the same access to the same servers with the same qualities, with the only difference being the amount of simultaneous connections allowed (“Unlimited” has 30, “XL Powerpack” 60), a rather unimportant technical detail which, in theory, might alter your downloading speed but is completely irrelevant for anyone with a regular Internet connection. You can argue that both plans are practically identical in regards to raw Usenet access. The more expensive variant, however, includes access to both Easynews and the all-new Newshosting VPN. While the VPN can only be described as work-in-progress, offering super-fast but otherwise rather basic Internet privacy and security (read more about it in our detailed review), Easynews is a very interesting but expensive site, allowing you to download from Usenet directly from your browser, with a very sofisticated search engine, showing you snapshots, previews and detailed information about media files such as movies before you even download them (handy to avoid fake files). For more information, we’re going to write a review of Easynews soon. 10 GB per month are allocated for you on this service, and you’ll have to decide if this is enough for you to go for the more expensive account. But before you go to Newshosting website and hit the “subscribe” button, hold on, because the fact that you read this article on The Load Guru means you can save money, as usual. On some places on the web, hidden among useless fluff and other trash, a link can be found, which cannot be accessed directly from the Newshosting website. Behind this link, there lies a special discounted deal for the regular “Unlimited” account. For only $9.99 per month or $99.99 per year, you get the exact same service others pay a minimum of $155 per year for, a discount of over 33%. It should also be mentioned that new customers can claim a free trial, or more precisely a money-back guarantee. If you don’t exceed 30 GB in downloads, you can get your money back in the first 14 days if you’re unsatisfied, which we don’t think you will. 3. Software, Search and Features: How Convenient And User-Friendly Is It? With a lot of talk about the new, proprietary client, it is important to note that not many providers come up with their own newsreader, because quite frankly most people rely on the well-known, established tools such as Newsbin, Alt.Binz or SabNZBD+; it is more common with more expensive services, such as Firstload and UseNeXt. All programs are remarkably easy to use and only require a few minutes to get used to the interface, and so many users don’t know what to make of these “exclusive” clients. As can be seen, the interface is very clean and organized, and the main features are easily accessible with a few easy clicks. Notice the upper part of the picture for a pretty complete list of what it offers: First of all, the largest binary newsgroups are displayed on the left of the screen, and content posted to them can be browsed: These listings look pretty much like the search engine results, which can also be seen here. We’d also like to highlight the file preview and NFO displaying functions: These allow you to get a good idea of what is hiding behind a result, although previewing could work a little better. Curiously, you can also set the software up to search for stuff on a regular basis and download matching files automatically, for lazy people with loads of free space on their hard drives. Why would anybody need such a thing? Because they can, that’s why! Also it might help to always have the newest content without having to manually browse through Usenet, with everything ready as soon as you return to your PC after a hard day at work or something, so there’s that… But nice to have it, either way. The Search Engine – A Replacement For Indexing Sites? Binsearch, NZB Index, these sites are well-known in the Usenet community, and commonly used to find content in the network. One kind of these sites are manually moderated indexes, more or less carefully selecting content and checking for its quality, while the other behave as automated search engines, very much like Google. Some providers have tried to replace at least the later with their own, build-in search engines, and Newshosting is among them; however these attempts often turn out to be rather futile, as can be clearly seen in our test of UseNeXT, and many doubt if it’s not wiser to rely on the good old ressources instead of switching to some new alternative. After all, so many good newsreaders are around, and the old-fashioned ways are often the best, aren’t they? In this case however, we think it’s fair to say Newshosting deserves a lot of credit for what they did for their client. First of all, you can freely select between Binsearch.info results (accessible from within the newsreader) or their own indexing service, so the choice is yours. Also we did two sample searches, with our usual examples: The movie “Steal This Film”, which you should absolutely watch, and the free operating system “Ubuntu”. As you can clearly see on the screenshot above and below this text, results were accurate and even featured additional information, such as the language of a file and sometimes even preview pictures were displayed. All in all, you can ditch Binsearch if you have the Newshosting newsreader, and this is a far better result than expected. However, consider that many, many fake files are around, and automated indexers usually don’t detect them, so having an account at some good Usenet forum or manually edited directory is highly advised, at least for more recent stuff – or, you’ll have to try around a bit and learn to distinguish crap from good content. In any case, the search engine is pretty cool and gets our “guru endorsal”! 4. Speed: How fast can you get that sweet content? Now, the build-in search engine matches or even far exceeds the ones integrated in both the UseNeXt and Firstload client, but what about the speed? As you might know or not know, we usually test with a high-speed connection, reaching up to 150 mbps, much more than most people have at home. To make it short and sweet: Speed is excellent, and this is not only talking about what our test showed when using a third-party newsreader optimized for speed, but with the actual Newshosting client. In fact, the speed was so excellent that we decided to use it routinely to perform speed tests for our reviews of VPN services – we call it our new benchmark reference. Out of 150 mbps, 130 mbps were reached, so high our hard drive actually wasn’t able to cope with all the data coming in, causing the download to be automatically put on hold for a few moments after about 40 seconds for it to keep up. Talk about a stress test… If you have high-speed Internet, chances are really good Newshosting will max your connection out. How good is their retention: For over 2344 days, old content is being kept on their servers. As was to be expected, their service has kept pace with the competition. With their retention at almost 6 and a half years, it seems they almost don’t delete old content at all anymore. An excellent result if you fancy a very large archive… when you were extremely limited in the choice of your downloads about 6-9 years ago because older stuff had to go to make space on their servers for new content, nowadays retention is almost a factor to be ignored when you choose one of the better providers, but Newshosting is among the very best, topped only by Giganews which provide about 4 days more. About security and encryption: As is standard with most providers, you have the option to encrypt your connection with SSL, particularly helpful if you are on a network with a snooping administrator, or if you don’t fancy your government tracking what you download, something more prevalent in repressive regimes. This is the same encryption used on online banking sites or by payment processors such as Paypal, so this provides you with pretty strong protection. No logs of what users download are being kept, no worries here: Based on how Usenet is structured, a provider would have to downloads tens of thousands of separate articles for each download, which is completely unrealistical. The verdict: We have a winner! What can we say? The lowest prices in the industry for such quality when you use the “hidden” discount links included in this article, great speed, retention and features; add the just awesome Newshosting newsreader to the mix, and you got your dream Usenet service just before your eyes. No need to resort to more expensive alternatives such as Giganews, or to go looking for volume based plans such as UseNeXT or Firstload offer: Newshosting tops them all: It has the better search engine, the better speeds, the better retention, the better plans. So, all in all, Newshosting can only be highly recommended. PS: A reader recently wrote us he did a search for the Newshosting-site and landed on the wrong page. Honestly, we have no idea how this might have happened, but here is a live preview of the correct website. Better yet, just click on the link at the top of the page, and you’ll be redirected to the right place, period.